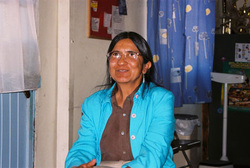 Dr. San Juana Mendoza has spent most of her career caring about and for the poor along the U.S.-Mexico border in Juarez. She was a young physician working for a Methodist clinic when she realized that the way of mercy and love was how she wanted to serve her fellow human beings. Dr. Mendoza established the Cristo Rey Primary Care Clinic on land that is a reclaimed garbage dump and is home to thousands of struggling families. While Dr. Mendoza was in the area, she spoke to several church groups, students at Concordia College, three worship services, and healthcare professionals. Dr. Mendoza stressed that the poor don't want to live the way they are forced to live. "They know the difference," she said. "I see the women learning more about their own health and then teaching others when they come to the clinic." Gardening and races are part of Dr. Mendoza's preventive healthcare plans for her people. "When disease comes, the people can only depend on their own healthy immune systems to ward off the viruses. That's why I want us to plant gardens with good food. And they like races. We don't have gyms where people can go and exercise. So we organize races for all ages where they can exercise their bodies and have fun, too," said Dr. Mendoza. Abriendo Fronteras--Opening Borders is dedicated to supporting Dr. Mendoza's ministry. Please support Abriendo Fronteras--Opening Borders with your donations and gifts so we can support Dr. Mendoza's work on the border. Click Here to make a donation.